Bill of sale and assignment of contract rights is in continuation of the “Purchase Agreement”, which was signed previously and this purchase agreement is being referred here. 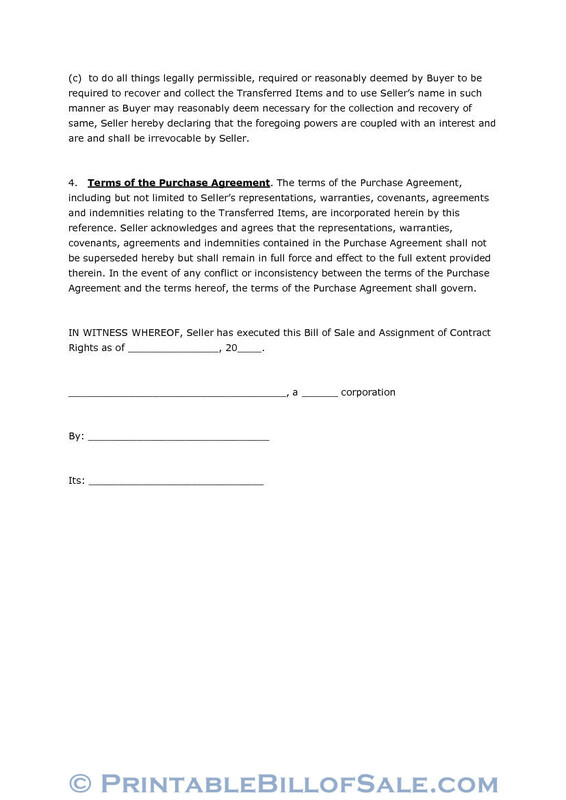 This is the bill of sale which will finalize the sale initiated through that “purchase agreement”. This is a general bill which can be used in all cities and states of USA, and if some country or state is having its own bill, that will be used. The bill will be governed by the law of the concerned State. In the bill of sale and assignment of contract rights, information about seller and buyer along with the effective date of the contract will be provided. The list of transferred items will be provided separately as Schedule A. Since this bill is in continuation of the purchase agreement, the reference of the concerned “section” of that agreement will be given here. Complete date of that agreement will also be given. The name of the seller and the business name along with state of incorporation are given. The name of the buyer and the time, date, month and year will be given. This is the date on which this contract will be effective. 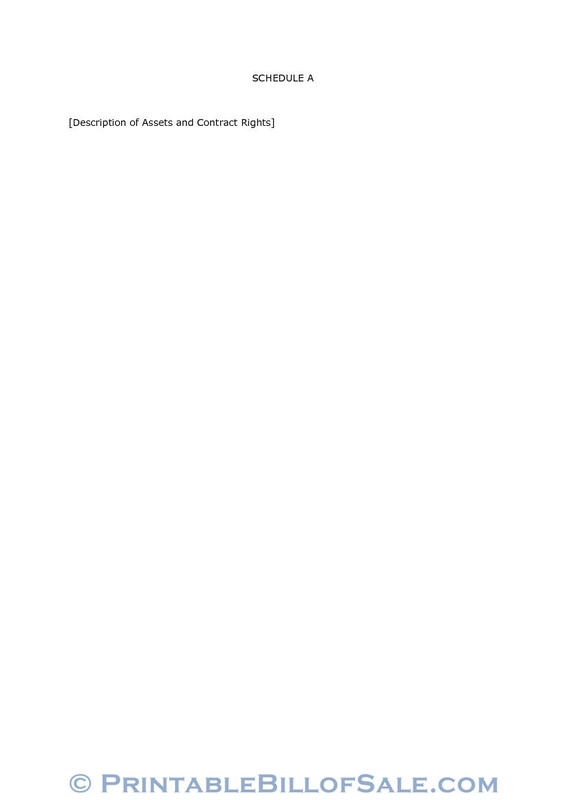 All assets, titles and interests are described in “Schedule A” of this bill of sale and assignment of contract rights. The seller gives a warranty to defend any transfer, conveyance, assignment of the transferred items by anybody and will provide all necessary documents to establish the ownership of the buyer in the government documents. The seller will also provide any documents required and requested by the buyer in connection with the transfer of the assets at the seller’s expenses. To deal with any legal proceedings in seller’s name or otherwise in connection with the equity or otherwise to collect or enforce any right or claim. To do all things legally allowed to recover and receive the transferred items and the seller also declares that these powers are irrecoverable by the seller. 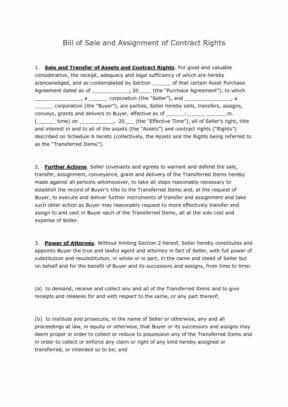 All the terms and conditions of the purchase agreement will be included in this bill of sale and assignment of contract rights, the seller acknowledges and agrees to all these terms and conditions. In case of any discrepancies regarding the terms of the purchase agreement and this bill, the terms and conditions of this bill of sale and assignments of contract rights will be implemented. 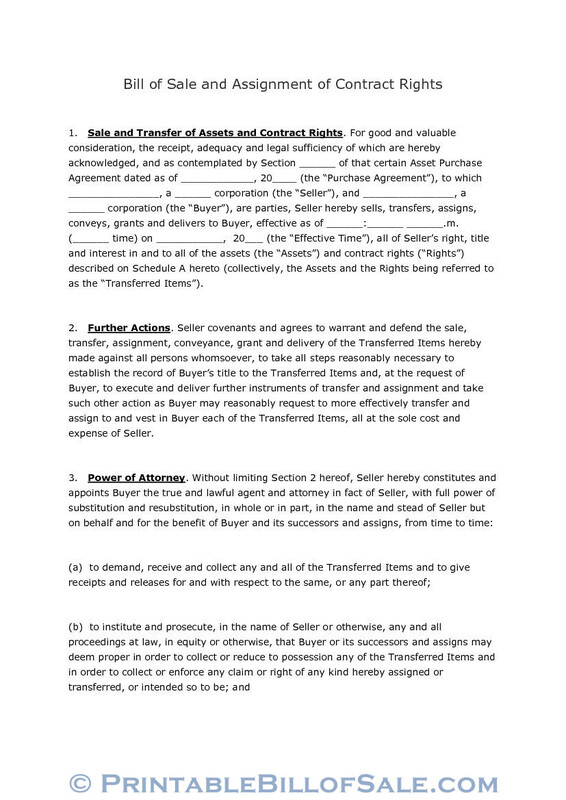 Here the seller is executing the bill of sale and assignment of contract rights, by putting his signatures. The date, month and year will be given. The seller will give his name and the business name along with state of incorporation. The witness will sign and give full name, and a notary public will also certify and sign this bill of sale and assignment of contract rights. In this portion full detail of assets, titles and interests will be given, and this will be attached to this bill as Schedule A.